It’s not a board game. And it’s certainly not a video game or a motorized thing-a-ma-jig. You won’t it find in any store. It often comes in pairs and your children will treasure this endlessly stimulating source of joy and laughter for hopefully many years to come. Not everyone is as fortunate. We know this and we appreciate having our parents in our lives every day. My kids don’t quite understand how blessed they are, but they sure enjoy spending time with and learning from their grandparents. 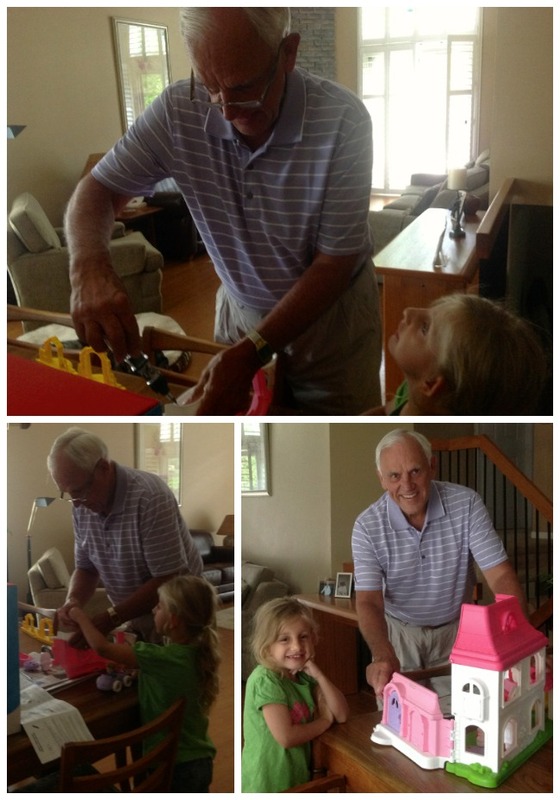 So my number one pick for the toy that is sure to bring a smile to a child’s face is a loving grandparent — the kind that gets down on the floor to play and enjoys spending time with their grandchildren. Maybe not every minute. The fact that my daughter gets up at the crack of dawn isn’t exactly enjoyable. The kids have spent quite a bit of time at my parent’s house this summer. They have a pool and a new park close by so there’s quite a bit to keep them entertained. But during a recent cold snap they spent more time inside and began to run out of things to do. Crayons and a deck of cards can only get you so far. This is why I recommend sending over a Toy Stash to keep at the grandparent’s (or babysitter’s). My parents have a bin filled with some of my kid’s favourite toys and books. I replenish it every once in awhile to keep things exciting. Last week I added Avery’s new Little People Happy Sounds Home. Bonus…my dad volunteered to put it together. I hesitated at first. God knows I didn’t want my kids exposed to an incident reminiscent of the Christmas tree assembly incident of 1982 which involved explicit language and a tree lying on its side, bent and abandoned in the middle of the living room. He did a great job with this though. It clearly helps to have a groupie cheering you on. like my daughter know the value of toys like these for development of imagination and creativity, and fine motor skills.